When it comes to parenting techniques, there's no shortage of clashing opinions. Whether it's the aggressive promotion of gentle parenting or the rigid rules of routine lovers, many people are sure they know what's best. Or, at the very least, they're determined to crow about exactly what worked for them. Sometimes I slip up and do the same; karma inevitably lands me with a run of bad bedtimes and stroppy lunches. It's easy to forget that different kids and different parents have different personalities and what works for one baby may not work for another. To me, part of being a good parent is picking the bits which best suit your own baby, rather than following the crowd. Anyway, along the way, Steve and I have been given all sorts of lectures, tellings off and raised eyebrows because of our parenting ideals. They said: If she got used to being held she would never learn to nap in her cot. We found: That at five months old she suddenly grew out of wanting to be held. Unless she's feeling really poorly, she much prefers to sleep sprawled out these days. They said: If she woke up and we were gone she would panic and scream for us; we would need to help her back to sleep every time she stirred. We found: This was true for a couple of weeks and then - presumably - she learnt not to expect us to be there when she woke up. We hear her stirring and getting herself back to sleep all the time; she rarely needs us more than once a night. They said: She would get used to co-sleeping with us and would be too scared to sleep in her own room until she was three years old. Also, assorted horror stories about how unsafe it is. We found: We didn't actually plan to co-sleep but she outgrew her crib at three months and we didn't feel ready to put her into her own room until she was five months. For two months, she shared our bed and nobody slept particularly well. When we moved her into her own cot in her own room, it only took a few nights for her to adjust. They said: If she was used to being helped she would never bother crawling or pulling herself to standing or cruising. We found: This kid wants to move. Being helped allowed her to move earlier and that made her happier but she's seven months old and she's already crawling, pulling herself to standing, cruising and optimistically (and unpredictably) letting go of our hands - a bit of support from her parents isn't slowing her down! They said: She was manipulating us and we had to nip it in the bud by ignoring her. We found: She very rarely cries and when she does there's a reason for it. We both feel very strongly that comforting our child when she's upset is preferable to leaving her in distress. We also don't believe that babies are capable of "manipulation". They said: Babies thrive on predictability; she would be stressed without a routine. We found: We both feel strongly that our job is to teach our child to recognise what her body is telling her rather than to get into a habit of controlling it; because of this, we don't enforce a routine. However, left to her own devices, we found that she falls into predictable patterns of her own and is generally a very calm kid. 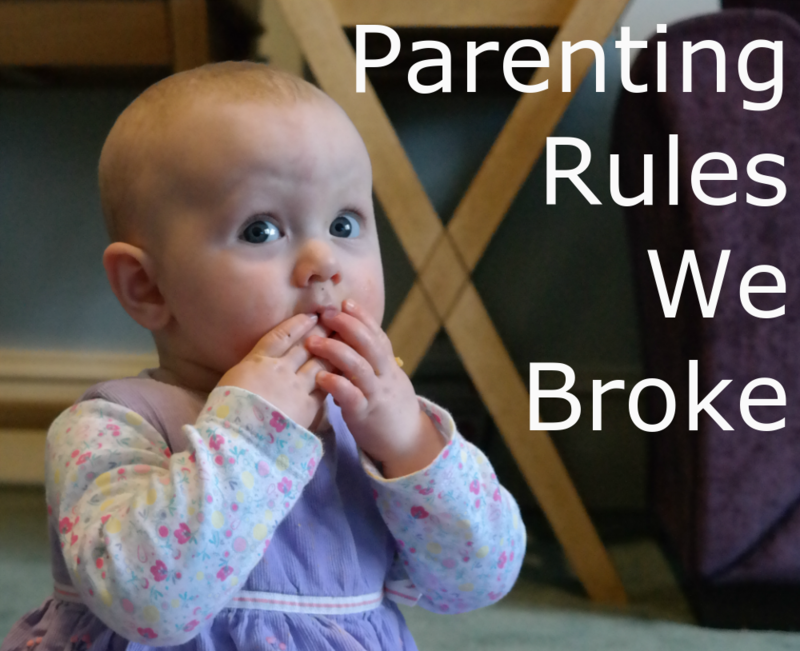 They said: Advice about weaning can be so divided - it's either stick strictly to purees or feed only solids from the start. Both claim to be by far the best option for a whole variety of reasons. We found: MM enjoys eating solids but she's dropped a lot of her milk feeds and doesn't drink much water yet; one meal of puree a day... eh... keeps things moving, if you catch my drift. Frankly, we don't see that there's much difference between thick puree and runny "solid" food like soup. What about you? Is there any parenting advice you've chosen to ignore?